Tattoos have been long in the native cultures but for reasons different than the ones now. The tattoos inked by the tribal people carried symbolic meanings and were only inked if a tattoo design had any significance for the respective person. However, tattoos became more of a fashion trend when rock singers started getting inked. Fans followed their idols and got themselves inked and slowly the trend of tattooing became more or less a fashion accessory. Today, celebrity tattoos have become quite common. More and more celebrities are being known to get themselves inked. The tattooing however, has now changed a bit for many get those tattoos inked which carry some significance and meaning for them in their lives. Amongst celebrities, it is not just the men who indulge themselves in tattooing, but female celebrities are just that much involved in tattooing. Here’s a list of some of those famous faces and their tattoos. Ariana Grande, an American singer and actress, has gotten two tattoos inked on her body. The first is a snipped of a quote from the movie ‘Breakfast at Tiffany’s’ at the back of her neck, which simply reads ‘mille tendresse’. The second one is a tiny half-moon tattoo below her ear. Tulisa Contostovalos, an English singer-songwriter, actress, and television personality, has gotten four tattoos in total on her body. One of the most famous celebrity tattoos inked by Tulisa is her nickname ‘The Female Boss’ along with the female gender symbol on her right forearm. She has a unicorn on her right shoulder blade while a ‘Lucky You’ tattoo inked just above her bikini line. The last of Tulisa’s tattoos is that of a vintage microphone surrounded by roses and the writing that says ‘RIP Uncle B N Dubz for Life’. 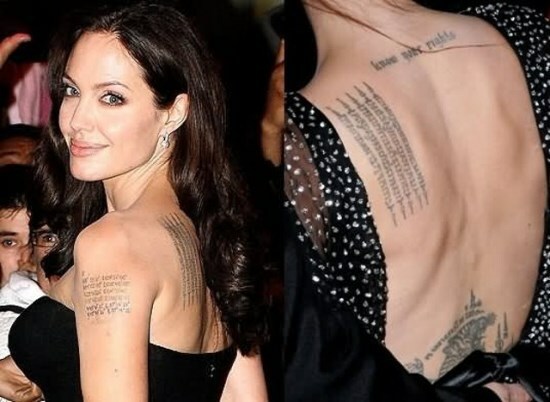 Among the many female celebrity tattoos that you see, Angelina Jolie’s are surely hard to miss. Each of Angelina Jolie tattoos carry significant meanings for her. However, many of her tattoos that we see now, such as the Sanskrit prayer on her left shoulder blade are overdone on a previous tattoo. Miley Cyrus, an American singer, songwriter, and actress, is also included under the list of female celebrity tattoos. In all, Miley Cyrus has around 30 tattoos on her body, 9 of which are on her right hand itself. The young actress has all sorts of tattoos on her body and has never yet shied away from showing them off. Rihanna is another female celebrity who has around 20 tattoos on her body, each one carrying deep and significant meaning for her. She has tribal to religious tattoos all on her body and shows them off with pride. Many other female celebrities are considered to be carrying some of the best celebrity tattoos on them. Included in the list are Demi Lovato, Katy Perry, Cara Delevingne, Rita Ora, Sarah Harding, Cheryl Cole, Lily Collins, and many more.